In order to help preparing the application for re-inclusion (to be submitted at the end of January 2020, at the end of the embargo period imposed by Clarivate Analytics), our journal has decided to change its frequency from trimestrial to semestrial. Starting 2019, the journal will produce two issues per year, scheduled for June 30 and December 31. We hope that the reduction of the number of issues will help increase the quality of the selection process for each article. In order to help preparing the application for re-inclusion (to be submitted at the end of January 2020, at the end of the embargo period imposed by Clarivate Analytics), our Author Guidelines have been amended with respect to the language. Starting March 2018, we do no longer accept submissions written in any other language than English. The correspondence language is English too. Also, our journal does NOT provide to authors, reviewers, or members of the Editorial Board any sealed certificates. Those who need an official document may receive per request a letter signed by the Managing/Executive Editor, with no seals or stamps, available only in electronic format. Starting with vol. 8, no. 1 of 2017, the journal Urbanism. Architecture. Constructions exists only in the electronic format, identified by ISSN 2069-6469. The identification of the journal by ISSN 2069-0509, assigned to the printed format, expires; the last printed issue is vol. 7, no. 4 of 2017. In addition, based on the problems identified by Clarivate Analytics, the journal introduced a new editorial policy aimed at ensuring the diversity of authors. Therefore, starting from vol. 10, issue no. 1 of 2019, the journal Urbanism. Architecture. Constructions will not allow the same author to publish more than one article per year as main authors and another as co-author. The publication of additional authors will be judged based on the perception of the first one by the readers. During 14-16 May 2015 EUROINVENT – 7th European Exhibition of Creativity and Innovation took place in Iasi, Romania. During the event, Urbanism. Architecture. 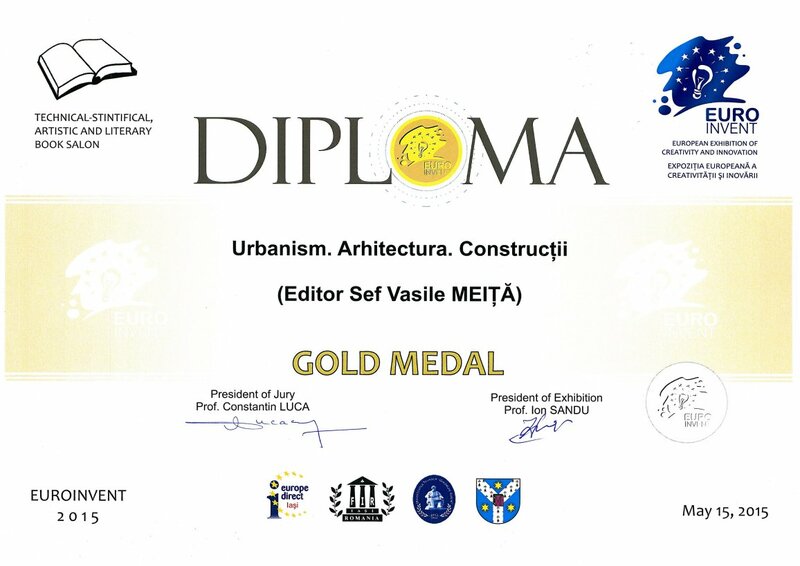 Constructions earned the gold medal of the Technical-Scientifically, Artistic and Literary Book Salon. 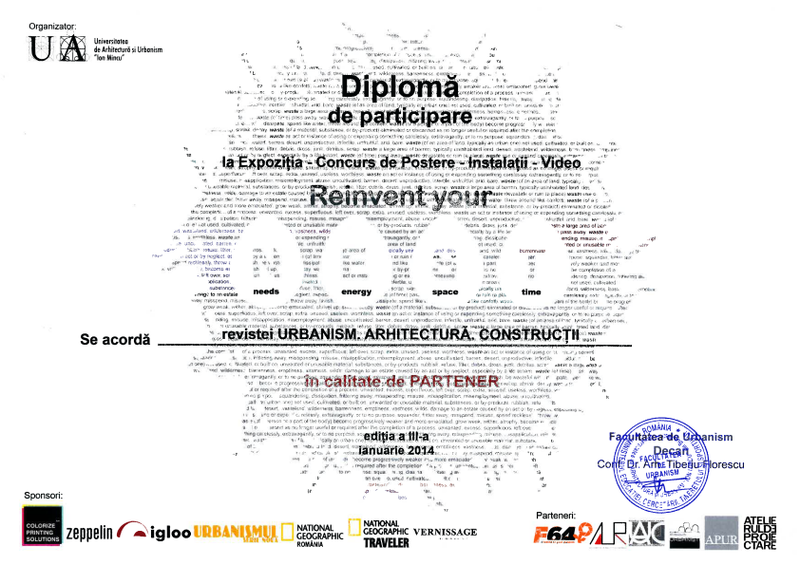 The Faculty of Urban Planning at "Ion Mincu" University of Architecture and Urban Planning in Bucharest organized during 16 December 2013 – 21 January 2014 the third edition of the Reinvent your N.E.S.T. idea contest. The event proposed to challenge the contestants to reflect on the relationship between waste ant the city / urban life, through the concepts of needs, energy, space and time. Urbanism. Architecture. Constructions was partner in the event.